Subway sandwich shop will let you take any of their sandwiches and turn them into a chopped salad. The first time I did this, the woman behind the counter was unfazed by my request until I asked her to top it with mayonnaise. She looked absolutely horrified! “You’re going to put mayo on a salad? ?” Well, yes, it’s basically all the components of a sandwich so why shouldn’t I? “That’s so gross. It’s still, like, a SALAD.” Heh. Whatever lady, load up the mayo and let me get on about my business. It was divine and just like eating my favorite sandwich. 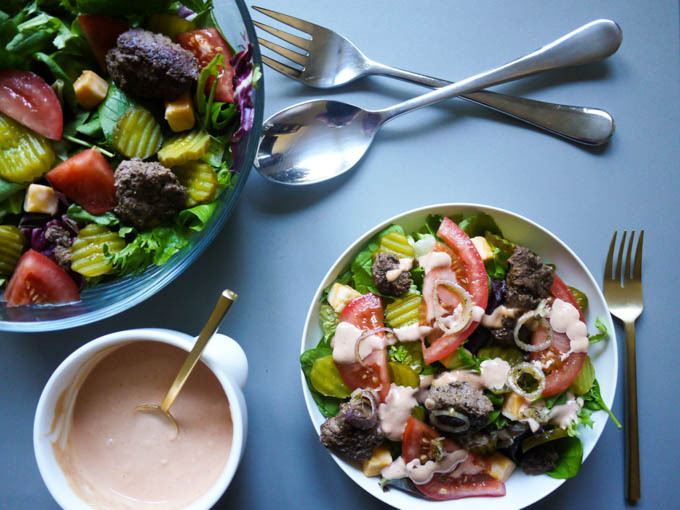 Whatever you like on your cheeseburger, you should toss it into this salad. Seriously. 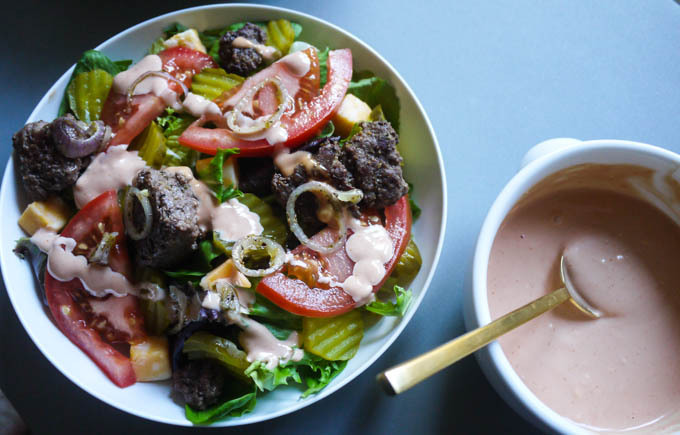 The fry sauce dressing is a kicked-up mix of that classic combo of mayo and ketchup. Salad packed with seasoned ground beef, marinated shallots, pickles, cheese and tomatoes and topped with fancy fry sauce. Add the shallot, oil, oregano, salt and pepper to a small bowl and use your fingers to crush everything against each other. Let sit for at least 5 minutes. 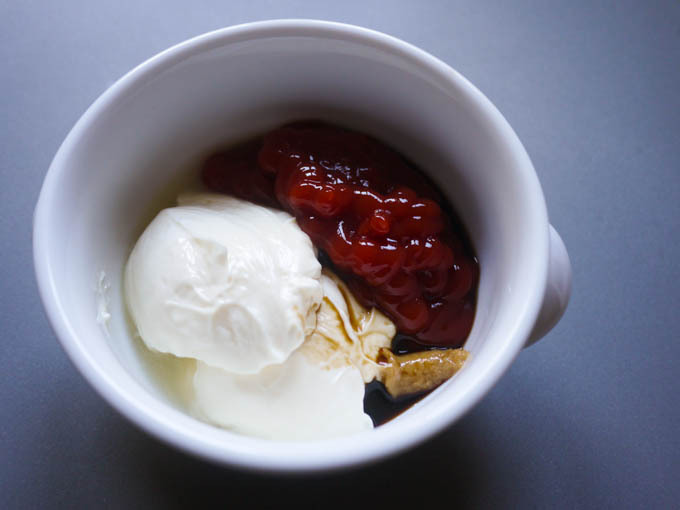 In another small bowl, mix together the ketchup, mayo, Worcestershire sauce, lemon juice and garlic puree. 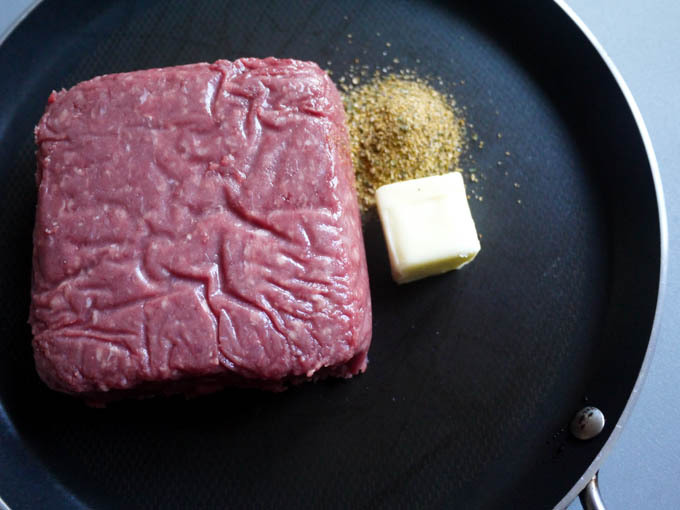 Combine the beef, butter and Montreal Chicken Seasoning in a skillet and cook on medium-high heat until browned, approximately 10 minutes, breaking the meat into large chunks as it cooks. I typically let the beef cool down for 10 minutes after cooking so that it doesn’t immediately wilt my salad greens and melt my cheese cubes when added to the salad. 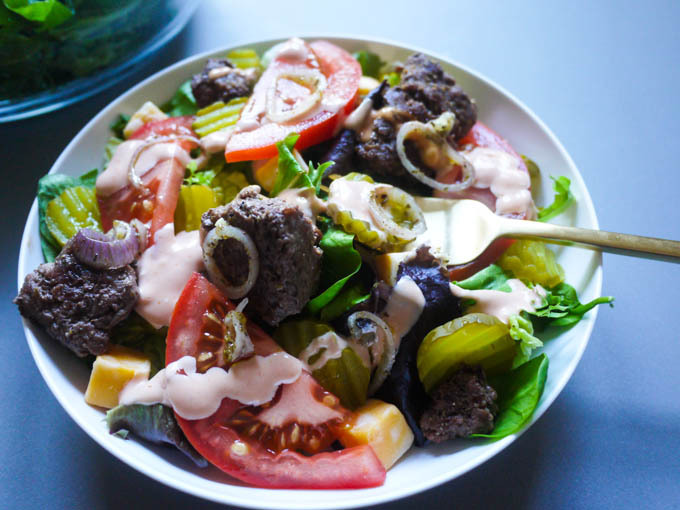 Assemble salad greens, pickle chips, cheese cubes, tomato wedges, cooked beef, shallot mix and fry sauce dressing. First thing we need to do is marinate the shallots. Letting them soak in this olive oil mixture takes some of the raw heat off them and everything combines to create a really flavorful oil that combines well with the fry sauce. Add the shallot, oil, oregano, salt and pepper to a small bowl and use your fingers to crush everything against each other. Let sit for at least 5 minutes. 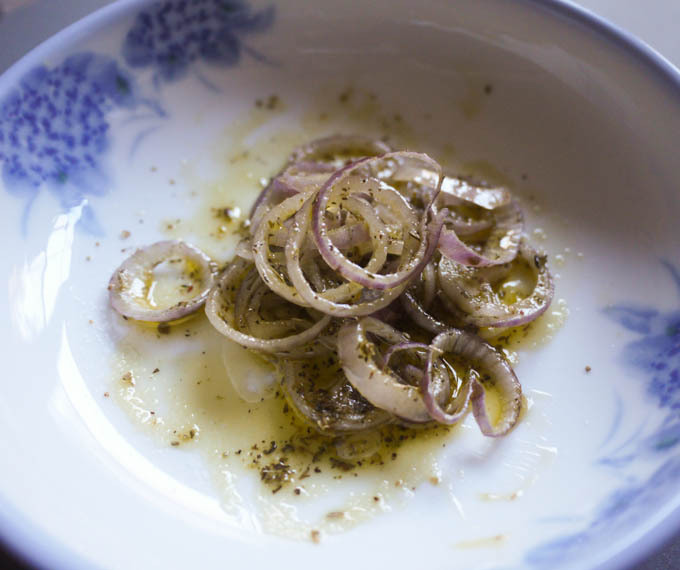 If you prefer a stronger onion flavor, you can skip this step and just add some minced red onion to your salad. The next step is making the fry sauce by mixing together the ketchup, mayo, Worcestershire sauce, lemon juice and garlic puree. 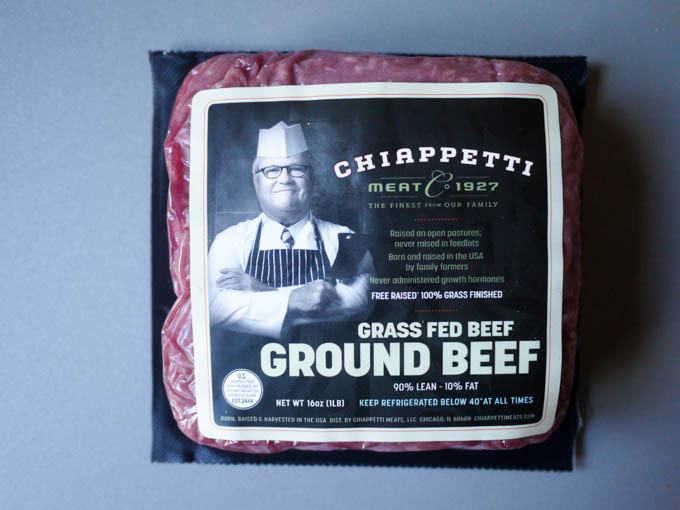 I am not usually a stickler for using grass-fed beef, but here it is a must. We aren’t cooking the beef for long and grass-fed just holds up better and delivers nice big chunks of meat with a medium center. Assemble salad greens, pickle chips, cheese cubes, tomato wedges, beef, shallot mix and fry sauce dressing.